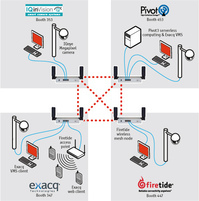 Exacq Technologies, Firetide, IQinVision and Pivot3 will host an joint interoperability demonstration with their respective systems next week on the ASIS International exhibit floor. The set-up is designed to show the ease with which equipment based on open standards can be networked. According to the Exacq blog, the live demonstration will feature wireless distribution, storage, and playback of HD/megapixel video over a wireless network across their four booths. Click on the thumbnail for a larger view of the schematic.